Below are common attributes associated to Zebra Grass. Become a care taker for Zebra Grass! Below are member comments regarding how to plant Zebra Grass. No comments have been posted regarding how to plant Zebra Grass. Be the first! Do you know how to plant Zebra Grass? Below are member comments regarding how to prune Zebra Grass. No comments have been posted regarding how to prune Zebra Grass. Be the first! Do you know how to prune Zebra Grass? Below are member comments regarding how to fertilize Zebra Grass. No comments have been posted regarding how to fertilize Zebra Grass. Be the first! Do you know how to fertlize and water Zebra Grass? Below are member comments regarding how to deal with Zebra Grass's pests and problems. 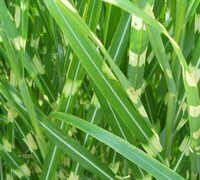 No comments have been posted regarding how to deal with Zebra Grass's pests and problems. Be the first! Do you know how to deal with pests and problems with Zebra Grass? I used to spend a lot of time and energy cutting back all my dormant grasses in late winter, but now I just burn them back with one match strike. Be careful, though, it puts off a lot of heat and can damage nearby plants. Soak surrounding plants and mulch or pine straw with the hose before-hand. I tie them up and use my gas powered pruners. My luck I would burn down someones house down. Ha ha. I just got a nice visual on that. Burning permit? Who needs a burning permit? The HCFD is very understanding, and always looking for something to do.